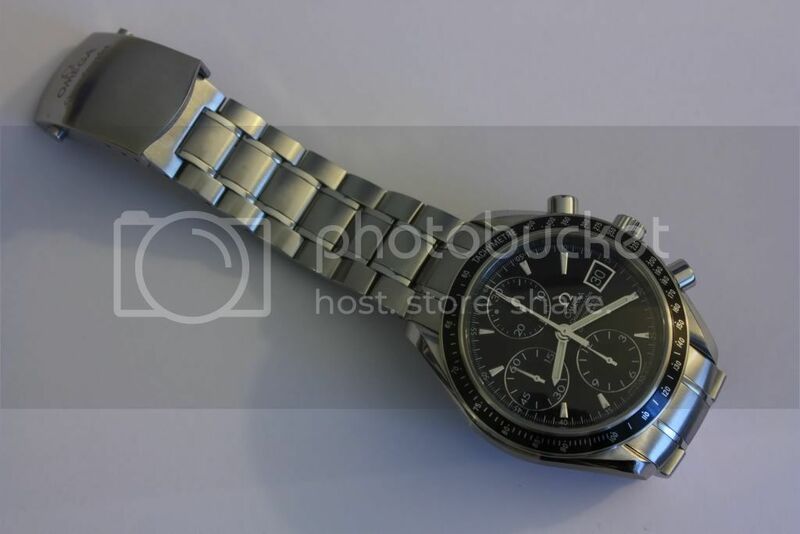 I am considering getting the Omega Speedmaster Date and I would like get feedback. First, the movement on this piece is the Omega Caliber 1164. Is this a good movement? 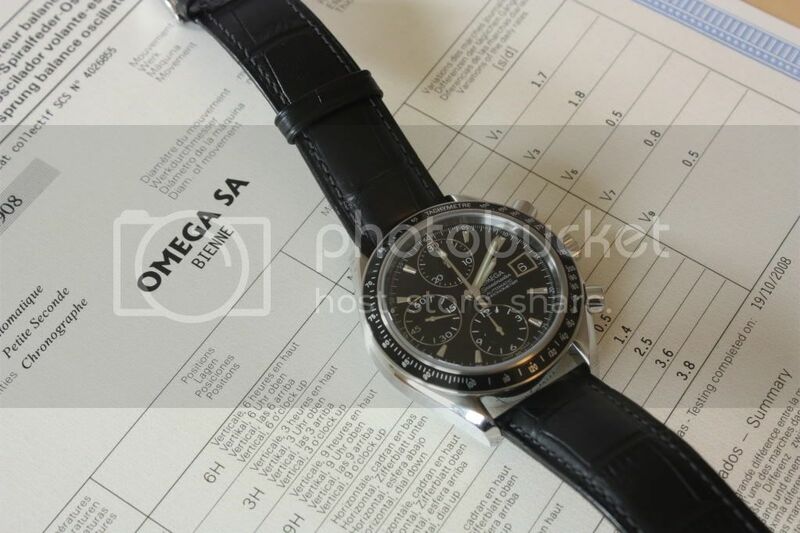 I’ve heard that Omega had problems with some of their 3300 series movements. Is this basically a modified Valjoux 7750 movement? Also, I would like to know if the highly-promoted co-axial technology is as good as the hype? This topic comes up once in a while. Many will tell you to skip the Speedy Date and go for a classic Speedy Pro, I'll jump ahead and tell you what I think of the Speedy Date having owned one for a while now. I've said it before on the forum, the Speedy Date is cursed, as it has to live under the shadow of arguably the best and most famous chronograph in history. Yet, if you shine a light on it you’ll discover IMHO the best value automatic chronometer-grade chronograph with date display in the market today. The 1164 is a great movement, Chuck Maddox used to rave about it on the SMP Chrono. It is a modified Valjoux 7750 movement with rhodium finish, adjusted to COSC/chronometer standards. While not the venerable Lemania/Omega Cal. 321-861-1861 that powers the Speedy Pro, the cal. 1164 is no slacker. This is where it gets confussing. The cal. 1164 powers the old-style Speedy Dates (like the one pictured below). The new style Speedy Dates with the tri-compax dial layout and date at 4.30 use cal. 3304, which is also a modified Valjoux movement (a 7753, variant of the 7750) with rhodium finish adjusted to chonometer standards. It should be as strudy as the cal. 1164 and not be confused with the cal. "33XX" (Piguet based movements) that power Speedy Broad Arrows and have been critized by some. Aesthetically, it is discreet, yet has a nice wrist presence, it is sporty, yet has enough bling to dress up with it. Works very well on my small wrists. However, it may look small on you if you have 7.5 inch wrists or above. I’ve always thought that chronographs, being sport/tool watches, shouldn’t look puny on your wrists. Overall, if you like it and it wears well on your wrist, you really can’t go wrong with this watch. Last edited by peitron; August 4th, 2011 at 17:24.
bluejeans, T. Wong, yessir69 and 3 others like this. Thanks so much for the very informative response. Just to clarify, the 1164 movement is slightly better than the newer 7750 based movement? Cause that's exactly the model that i was lookin at. I would most likely get the silver face dial and you probably just sealed the deal for me. The newer cal 3304 has one specific technical difference to the cal 1164 that might have a slight bearing on your choice - the date of the cal 3304 is adjusted using a push button at the 10 o'clock position, while the cal 1164 uses the regular crown adjustment. I don't believe that one is better than the other, it's rather just a matter of preference on whether you want to use a pen or similar to change the date. I otherwise think that Peitron summed it up perfectly. I have the same black 3210.50 and find it a very nice and highly underestimated watch. I'll post pictures of my one with different straps when I get the chance later. I couldn't say that the cal. 1164 is better than the cal. 3304, since I don´t have any objective base for such a statement. ChronoScot above explained the difference in date setting. Other than that, they are both basically the same base Valjoux movements with different dial layouts that have been adjusted by Omega to comply with their internal standards. I guess, objectively, the only difference is that the cal. 1164 has been around a few years longer than the cal. 3304. The cal. 1164 Speedy Dates are cheaper, but they are being phased out in favor of the newer cal. 3304 Speedy Dates. Now, aesthetically, the cal. 1164 and cal. 3304 Speedy Dates are different. You should still look at both models to determine which you like best. I couldn't say that aesthetically one is better than the other, that is a subjective judgement that each must make. Perhaps the old style cal. 1164 Speedy Date is somewhat more sober -with it's guilloché dial- while the new style cal. 3304 Speedy Dates -with splashes of red on the dial and second hand and sunburst dial- is more youthful. Some will prefer the 12-6-9 dial layout of the cal. 1164, others the 3-6-9 "tri-compax" dial layout of the cal. 3304 since it evoques the Speedy Pro (but I personally don't really like the slanted date window at 4.30). You really can't go wrong with either if you like how they wear on your wrists and you're willing to live with the fact that it's not a "Moon Watch" (which is tough for a WIS). Good luck and post pics if you get one. 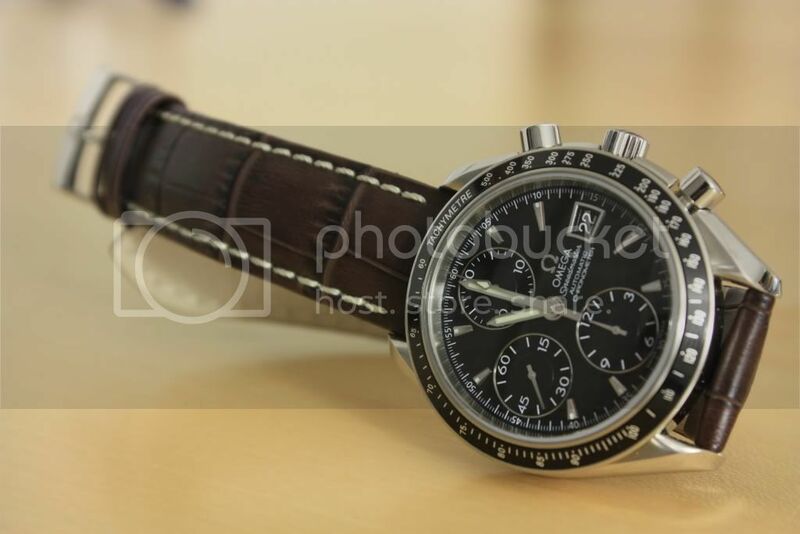 ChronoScot has several real cool pictures on different straps he'll surely share later. Last edited by peitron; August 4th, 2011 at 20:57. 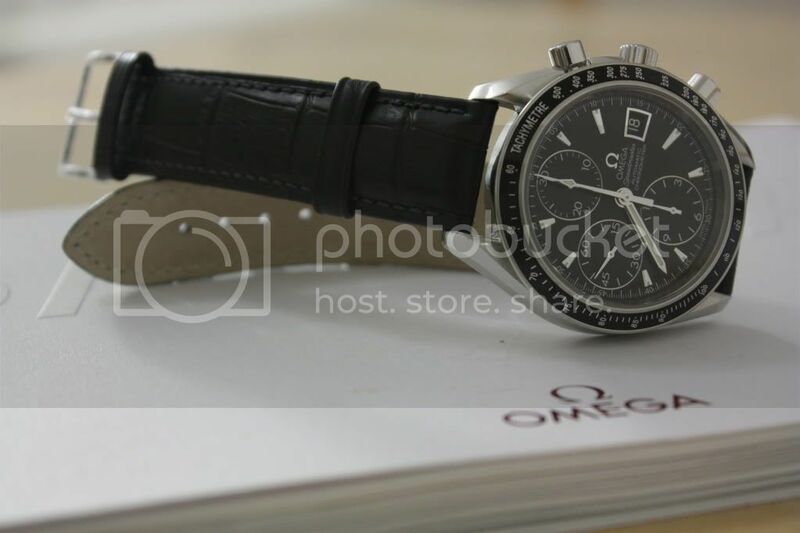 I bought a speedmaster date with the 7750, not knowing what I was doing. 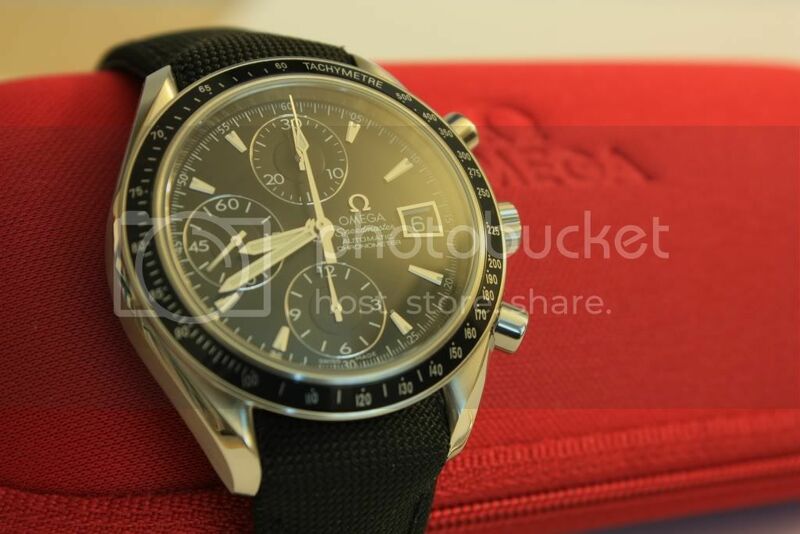 As a timekeeping watch, it's been great, it is not as expensive as the 'real' moonwatch on the used market, and it came in some interesting colors. 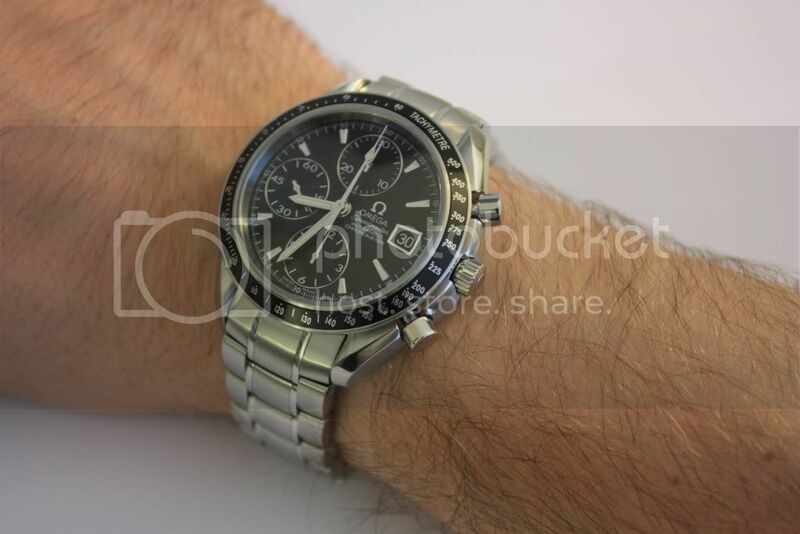 Mine has grey dial, rhodium plated subdials and a silver bezel. It keeps excellent time and mine gets a fair bit of wrist time. I suspect that eventually I'll be getting a pro just because I can, but I'm keeping this one too. Honestly, it's much more important to have what you like anyway. bluejeans, T. Wong and mitadoc like this. Thanks all for the response. Those were very good information and some awesome pics as well. 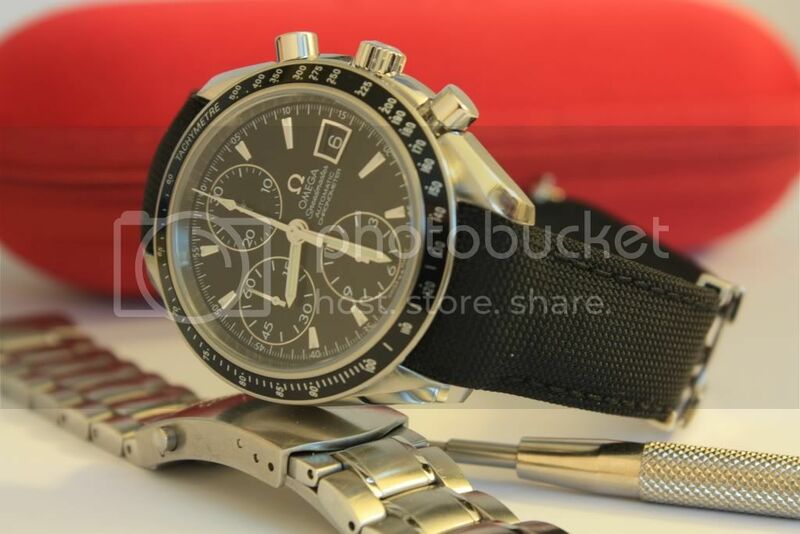 I am looking at acquiring the silver face speedmaster with the date at 3 o'clock just like the ones in the photos. I'm sold! This is on a 3304 movement. It's even nicer in person! I've owned both the Pro and the Date--they were actually my first two "real" watches--and both are great. The 1164 caliber seemed rock solid, substantial, and had that nice, healthy 7750 wobble (a slight mechanical whirring noise when the uni-directional rotor rotates in the non-winding direction). The finishing seemed on par with Pro, and the dial (mine was the blue-dialed 3212.80) with its applied hour indices looked very sharp, potentially dressier than the Pro's lume markers. The 40mm diameter also seemed well-balanced (though teetering on the larger side) on my 6-inch wrist, and should look right unless your wrist size and shape are more suited to 45mm+ watches. I still have the Pro but was forced to give up the Date for a reason I haven't seen mentioned on WUS before: the shape of the caseback made it so that its edge would chafe my wrist pretty badly. While my experience may be unique, no other watch I've owned has given me that problem, so it may be something to keep in mind--especially since you won't really be able to size the bracelet and see whether its a problem until you've purchased the watch.